SS07 started with all competitors in good spirits and refreshed following the official rest day in the Dakar bivouac situated in the area of Bolivian city La Paz. At 3,625 metres altitude, the La Paz bivouac ensured competitors were treated to spectacular views and, of course, some well-deserved sleep. At the same time the Mini racing vehicles were checked and prepared ready for the restart of Dakar with SS07. 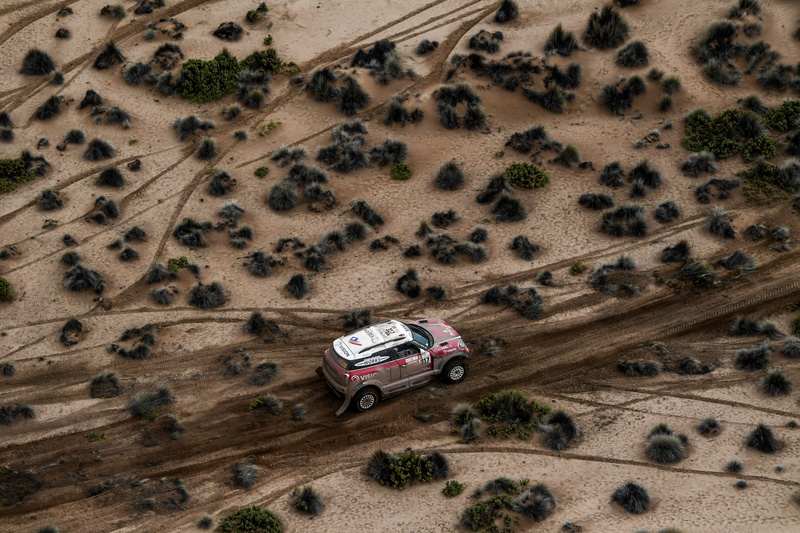 From the moment the auto competitors completed the liaison stage and the start of the off-road special stage, the sand and dunes of Bolivia’s plains began to affect the competitors and the outlook of the racing. Soft sand amongst the areas of camel grass caused problems for many crews, including the five crews of the Mini Family, with their cars frequently getting stuck. If the sand conditions were bad then the rain that followed made conditions even worse. Muddy terrain became very slippery and large puddles of water began to form to hide large rocks that would ultimately damage cars of the less than lucky competitors. Jakub Przygonski and Tom Colsoul fared best of the Mini Family and were the first Mini crew to make it to the end of SS07 with a hard fought fourth place. This result means that the MINI John Cooper Works Rally (#312) crew maintained their overall position of sixth. "It was a long and tough day, more than 400km," said the Pole. "Saturday was a racing stage for us because we were fighting with another competitor for the 400km we were together, a bit like motocross, but it was nice and we enjoyed the stage. But there was a lot of water, water crossing and there was really soft dunes through the Camel grass, which was terrible." "The car is ok and this is most important on this marathon stage because we have no mechanics and we have to do the work by ourselves. For now it looks good. Tomorrow will be a really long stage and for sure fast. It was raining and I think the rain and the surface water is always hard because the muddy conditions are not so easy to drive on." Boris Garafulic (CHI) and co-driver Filipe Palmeiro (POR) was the second Mini crew to successfully SS07. Their Mini crew arrived at the Uyuni finish point in ninth place to lift them to 22nd in the overall race category. "It was good; very demanding; very hard. A tough, hard day but I’m happy to be here. I think some of the other guys will have had problems because it was very demanding with the soft sand. The car is ok. We and the car are ok and right now we have to do the maintenance bit. As for tomorrow’s race? I don’t know – we have to take it day by day." The remainder of the Mini crews were significantly delayed. Whether this was due to the conditions or for other reasons is unclear due to the fact communication systems in the mountain regions is limited. 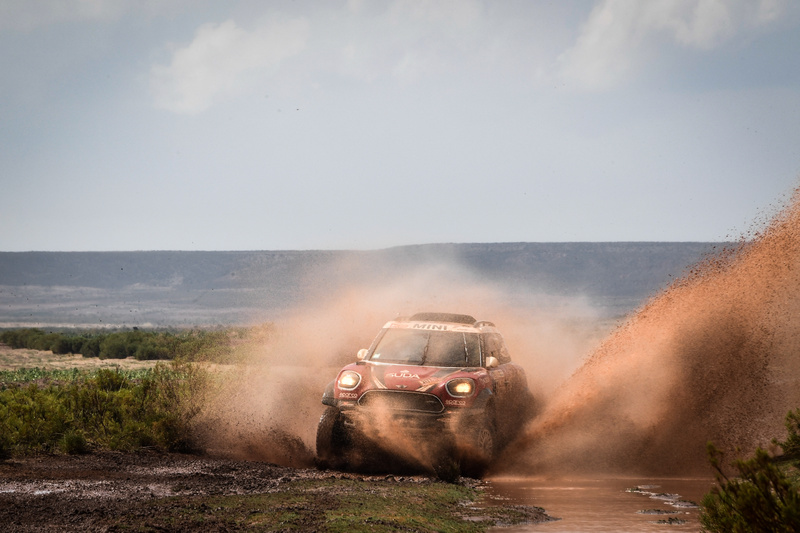 However, Dakar race control was informed that the Mini crew of Orlando Terranova and co-driver Bernardo Graue completed the stage in 31st place. Mikko Hirvonen and Andreas Schulz finished seven places behind in 38th and 4hrs behind the first car to finish the stage. Unfortunately, the crew of Yazeed Al Rajhi / Timo Gottschalk were not classified in the stage results.